The G6CU/G6AU is a 3.5-liter V6 engine of the Sigma series, both also called 3.5D. 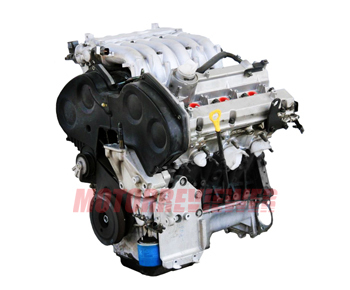 These engines are the largest engine in the series available for Hyundai and KIA mid-size SUV and minivans. The engine is similar to the Mitsubishi 6G74 engine for the Pajero. The engine has cast iron cylinder block, aluminum DOHC cylinder heads, and four valves per cylinder. It features forged steel connecting rods. The valve train has hydraulic lifters. The camshafts are driven by the timing belt and don't have variable valve timing system. The engine is equipped with electronic MFI fuel injection system and cast aluminum intake manifold. The low compression ratio allows using regular gasoline. Many parts of the engine are interchangeable with the Mitsubishi 6G74 engine, such as crankshaft, pistons rings, main bearings, etc. The engine was released in 1999 for the Korean market first, and in 2001 in the USA as the new engine for the Kia Sedona minivan. The engine has the problem with active main bearing wear, crankshaft damages, cylinders, and connecting rod bearings wear. The engine produces knocking noises usually at the start, but if the G6CU has severe damage, it will beat all the time. The reliability of this engine is under a question. Some of them went to garbage or required cylinder block rebuild after 45-60k miles. The engine life is about 100k miles because of the low quality of crucial engine parts and components (bearings, oil rings, etc.). If you want to rebuild your engine, better order the OEM parts for the Mitsubishi 6G74.